A 2017 national ranking placed Detroit last out of 100 cities for “17 key indicators of livability, affordability and veteran-friendliness.” According to one study, in 2015 Michigan had over 5,000 homeless veterans. These statistics prompted Jarret Schlaff to create a worker cooperative that hires veterans to make high-end sneakers, boots, and other apparel using recycled materials from the auto industry. The idea, simply put, is to enable Detroit veterans to improve their economic circumstances by becoming co-owners of the business where they work. 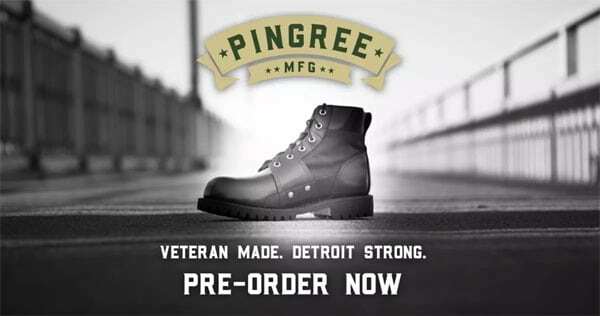 The result was Pingree Detroit, launched in January 2015. All told, the group raised over $200,000 in startup capital, as well as benefitting from donated equipment (mostly from the auto industry). Why Pingree? As Samuel Corey writes in the Metro Times, “The name was chosen after Hazen S. Pingree, a Civil War veteran and a bootmaker who later went on to become the Mayor of Detroit and subsequently the Governor of Michigan.” He was also a social activist in his day. The startup effort is small. The business currently employs six people, but Schlaff envisions that the business will grow larger over time. Workers at Pingree earn between $13 and $15 an hour, which, while not high, does provide a living wage in a city where, according to Census data, median household income is a little over $26,000 and the median rent just over $750 a month. As soon as someone starts with us and becomes a full-time employee, after one year of getting leadership development training, of learning everything from governance to how Pingree does what we do, embracing the culture, the owners get together and we decide, “Do you wanna invite this person on as a co-owner as well?” And then we invite them on and they become a co-owner. They are more involved in decision-making. They are more involved in profit-sharing. Pingree is still very early in its development. This year, sales are on track to generate a modest $100,000 in revenue. Next year, the firm’s revenue target is $464,000. To date, Schlaff tells Corey, the co-founders have yet to receive a dime. Schlaff himself makes his living by bartending, which allows him to wait for sales to ramp up. After the first 10 years, Schlaff anticipates that workers will buy out the investors who helped front startup capital. Disclosure: Steve Dubb is a member of the board of directors of the Center for Community-Based Enterprise (C2BE), which has provided technical assistance to Pingree.